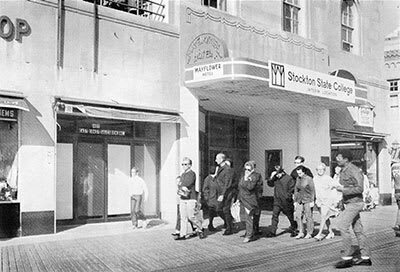 From its earliest days, Stockton has been a critical part of Atlantic City. The first classes were offered at the Mayflower Hotel at Tennessee Avenue and the Boardwalk. Students and faculty from that first year proudly identify themselves as "Mayflower" students and faculty. Nearly 50 years after first opening on the boardwalk, Stockton has returned to Atlantic City. The stunning Stockton University Atlantic City campus is a beach-front living and learning environment that is without equal in the United States. In April 2016, the state of New Jersey designated Stockton University as an Anchor Institution. The decision to do so recognizes Stockton’s impact on Atlantic City and the surrounding region, as well as its potential to contribute to, and help stabilize the local economy. Honoring the University's designation as an Anchor Institution, the Opportunity Fund will provide support for initiatives designed to expand Stockton students' engagement with and in Atlantic City. The Fund will support efforts that emphasize student experience as well as University and Atlantic City collaboration. This special scholarship fund is designated for qualified students who graduate from Atlantic City High School and choose Stockton. Scholarship assistance aids student success. Gifts of all sizes make an impact and will be recognized appropriately in a permanent way at Stockton Atlantic City. In addition, a wide array of naming opportunities are currently available throughout the campus. These meaningful gifts start at $10,000 and include naming rights to a variety of spaces within the two campus buildings; main lobby, lounges, office space, classrooms, quads and more. Contact Dan Nugent, chief development officer, for more information at (609) 626-3546 or daniel.nugent@stockton.edu. Alumni, donors and friends of Stockton University are welcome to tour the new campus. Contact Ayisha Lee at (609) 626-4753 to schedule your tour.